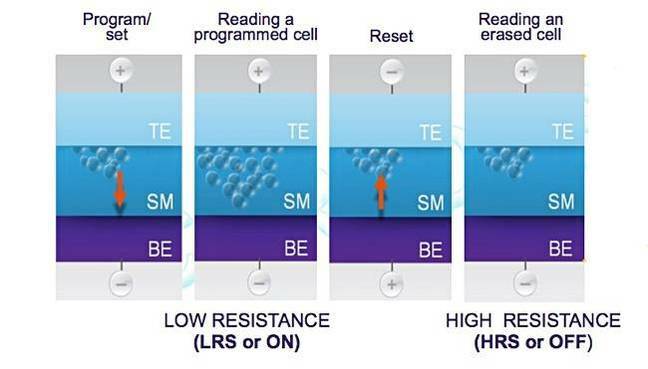 David Manners - Electronics Weekly - January 16, 2017 — Crossbar, the six year-old ReRAM specialist with $80 million VC backing, is sampling embedded 40nm ReRAM from SMIC and expects to have 28nm technology available in H1. Crossbar says the technology will scale to 16nm and 10nm. Crossbar’s business model is to be an IP house licensing the technology but says it is talking to customers about making discrete memories. ReRAM is one of a bunch of NAND alternatives including the Intel/ Micron phase-change memory 3D XPoint, Nantero’s carbon nanotube memory NRAM, and MRAM. Crossbar’s technology can be stacked in 3D, potentially delivering multiple terabytes of storage on a die and allowing logic and memory to be integrated onto a single chip. Crossbar says its technology will deliver 20x faster write performance, 20x lower power consumption, and 10x the endurance at half the die size, compared to NAND.